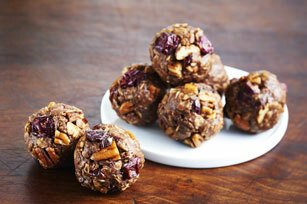 Combine Peanut Butter with Chocolate, dried cherries and pecans for this easy-to-make recipe. Our recipe only uses 5 ingredients to make the perfect treat. These easy-to-make Chocolate-Peanut Butter Snack Bites can be refrigerated up to 1 week before serving.